Original Review, August, 2008, two years from vintage date: This has been one of my favorite Aussie shiraz in past vintages. 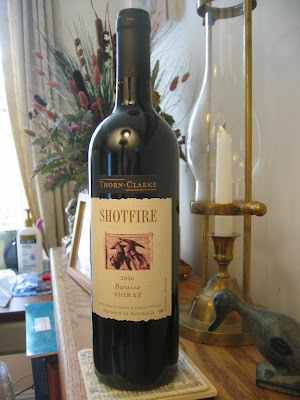 My review of the 2005 Thorn-Clarke Shotfire Barossa Shiraz is here. Let's see how the wine - and my palate - have held up for the 2006 vintage. In the glass, the 2006 Shotfire is dark blood red with a hint of purple. Aroma is velvet-cream furniture polish - wonderful! On the palate, the extracted black cherry moves up into your mouth, bringing sprightly acids along with the flowing cream. Finish seems a bit one-dimensional and "hot" from alcohol (which comes in at 14.3%). This time, I'll give it three stars with a plus for potency. I awarded four stars plus for the 2005. Wine Spectator awarded 91 points to the 2006 Shotfire, saying, "Aims for refinement and achieves a supple balance of ripe plum and currant fruit against a range of sweet spices and fine tannins. Lingers gently and expressively. Production was split between cork and screw-cap closures. Tasted from cork. Drink now through 2016. 15,000 cases made." Following a full 24 hours decanting: Similar impression overall. Palate moves towards inky black cherry. Hot finish is toned down, brings depth and balance. Very nice. Suggests this is quite ageworthy. Updated review, December, 2014, now a whopping eight years from vintage date: Still deep, blood red magenta and black, opaque from a half inch in from the edge of the glass. Soft and lively velvet Aussie shiraz nose. With age, this shows less creaminess and more brightness. Brings plums - as you'd expect - along with friendly spices. Held up well to age and I'd leave the same ***+ score. Good review. The Shotfire has been one of my favorites for quite a while. I'm curious how the wine does after the alcohol blows off a bit. Nice to see Thorn-Clarke hasn't lost their touch.